turn to persimmon and crimson and gold. is in the cool, crisp breeze. of warmth and life and growth. full of brisk, invigorating possibilities. Beautiful warm colours Jodi! Are you by any chance ok to put a guest post together for this weekend-ish? How are you placed? I will try Liz! Let me work on some evening this week. How should I get it to you? My email is mckinneyjodi@gmail.com if that helps. Stunning picture and a great poem! Puts you in the mood for Fall. 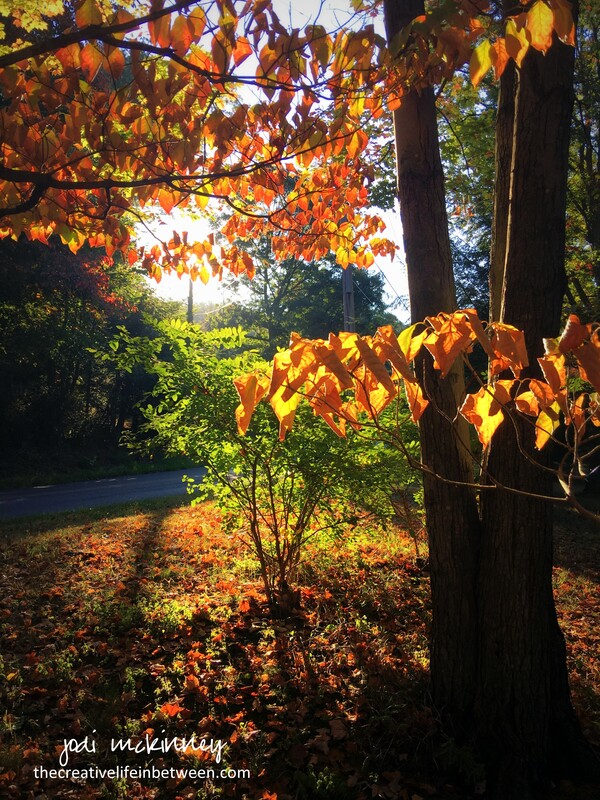 We hit 90 degrees yesterday and the day before – crazy hot temps, but the leaves are still beginning to turn and the early morning air has that “feel” to it! It’s been a beautiful beginning to Fall. Yes it has. Too humid here to feel like fall yet though. Beautiful photo and lovely poem!! The photo looks so crisp and bright! Thanks PJ! It was such a beautiful morning walk. Temps have still be unusually hot for our area this time of year – 90 yesterday! But the sky has been so clear and blue and the leaves changing. Quite beautiful. I can tell by the picture that it is very beautiful there in the fall. The high here today is 66 degrees. Very nice!! Enjoy it while you have it! Thanks George. It was a beautiful morning. Beautiful post! I’m so ready for everything Fall, except maybe the raking of leaves. They haven’t turned their gorgeous colors here yet. Thank-you! Beautiful Jodi, I love this time of year too! your poem was a breath of fresh air this morning! It was that morning until it turned 90 in the afternoon. I love your beautiful poem Jodi! It has been very hot here in Oklahoma too, almost 100 degrees this past weekend. I am also ready for a temperature change so I can pull out my fall jackets and sweaters! It’s been record breaking hear here too. So strange. Yet the leaves are trying to tell us it’s time! And the morning breeze is still divine. I’ve never thought of it that way, but you are right: the leaves are the flowers of Fall! Thanks Jenna! It was a long my walk one morning this past weekend.